Does barefoot running cause injuries? Barefoot running, or running in a minimalist shoe, has received increasing attention within the popular media over the past several years. The training variables most often identified as risk factors for overuse running injuries include running distance, training intensity, rapid increases in weekly running distance or intensity, and stretching habits. Now that we have discussed many interrelationships among various clinical and biomechanical factors, we hope you are gaining an appreciation for the complexity of comprehensive analysis of the entire lower extremity. You can read Human Kinetics e-books on desktop, laptop, and various mobile devices, as long as you have authorized the device or e-reader app to read e-books protected by Adobe’s digital rights management (DRM). Running Mechanics and Gait Analysis With Online Video is the premier resource dedicated to running mechanics and injury prevention. Running continues to be one of the most popular sports, despite the fact that up to 70 percent of runners will sustain overuse injuries during any one-year period. Therefore, it is imperative for health care professionals, coaches, and runners themselves to be informed on injury prevention and optimal treatment. Referencing over 250 peer-reviewed scientific manuscripts, this text is a comprehensive review of the most recent research and clinical concepts related to gait and injury analysis. Early chapters introduce readers to the basics of running-related injuries, foot mechanics, and shoe selection before progressing to discussions of knee and hip mechanics, ways to influence gait mechanics, and technical aspects of video gait analysis. Via a detailed joint-by-joint analysis, the book pinpoints common problem areas for runners and describes protocols for treatment. Later chapters present case studies of injured runners to guide professionals through a detailed biomechanical analysis and treatment recommendations, and an overview chapter summarizes the interrelationships of movement patterns at each joint with anatomical, strength, flexibility, and kinetic chain factors. 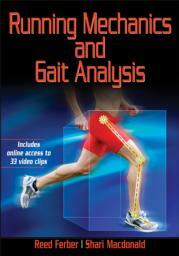 Running Mechanics and Gait Analysis With Online Video is the most comprehensive resource for running-related research. Readers will come away armed with the knowledge and tools to perform an advanced clinical assessment of gait and rehabilitate and prevent running injuries. Continuing education credits/units may also be earned on this topic. The Running Mechanics and Gait Analysis Online CE Course includes the complete e-book, online video, and a continuing education exam. Chapter 7. Can We Influence Gait Mechanics? A comprehensive resource for physical therapists and athletic trainers involved in clinical assessment and treatment of running-related injuries, personal trainers and coaches invested in preventing injuries and improving running performance, and serious runners with a basic knowledge of biomechanics and a passion for learning. Reed Ferber, PhD, CAT(C), ATC, is an associate professor in the faculties of kinesiology and nursing at the University of Calgary and cofounder and director of the Running Injury Clinic in Calgary, Alberta, Canada. Since 2003, he and his colleagues at the Running Injury Clinic have been among the world’s leaders in 3-D gait assessment and technology. Ferber received his PhD in biomechanics from the University of Oregon in 2001. He is a research associate for the Institute of Sport and Recreation Research in New Zealand and a certified member of the Canadian Athletic Therapists’ Association and the National Athletic Trainers’ Association. He has won several awards in teaching excellence and has authored or coauthored 43 articles appearing in Clinical Biomechanics, Gait and Posture, Clinical Journal of Sports Medicine, Journal of Sport Rehabilitation, and other publications. Shari Macdonald, BSc, PT, MSc, has worked for over 15 years as a physical therapist specializing in the assessment and treatment of musculoskeletal injuries. She has earned postgraduate certifications in manual therapy, dry needling techniques, and sport. Shari is the chairperson for the Alberta section of Sport Physiotherapy Canada and is a national board member. Since 2009, Shari has been the clinic director at the Running Injury Clinic in Calgary, Alberta, where they specialize in assessing gait biomechanics and the treatment of running injuries. Shari earned her master of science degree in biomechanics from the University of Calgary.